What’s the rationale for the magic ratio of 0.01 and 0.03 lot size? Why not 0.01 and 0.04 or something else? I see that you talk about cash value instead of pips. It makes sense since there are multiple currencies pair involved and each pip value is different. Wondering how you calculate and handle the cash value in your system. The ratio of .01 and .03 is so that the second position triples the first and it doesn’t eat up more margin as, say, a .04 or more. I seemed to find a sweet spot (with the help of others) that the triple position gets the total position into a place where only a handful of positive pips is needed…without killing the margin. With the account size being the driving force behind the lot sizes and TP… I know that by running a certain number of pairs with those lots (given the .01 and .03 ratios per X amount of money in the account) that I will be able to TP with only a few TPs and also know that I won’t have margin call issues. Sure you could do a larger martingale…but you would need to know that you are running the right amount of pairs and have enough margin to cover larger martingales. The TPs are based only on TP money. This means that for one pair I may need 6 pips for my position(s) to close…and for others I may need only 4 pips for a TP. It varies. I am thinking, why not do a single martingale instead of triple on the second position? That would offset the first position to breakeven and keep the margins low even if the second position goes south as well. Yes the second positions won’t make any profit, but I think the main profit generators are the trades that close with only the “first positions”. Effectively, it will be able to run more currency pairs with same amount of capital. I’m new here and did read your post, where can i find this EA, would like to try! Hey everyone! Sorry I’ve been away a bit. @bunchofkeys, I do a triple martingale so that the position can actually be negative in pips but still make a profit. For instance, the first position goes south and is down 40 pips. The triple that opens may only need 10 pips in order to make more than the loss of the first position, thus a TP is hit on the position as a whole but the pip could is actually negative. I can’t say on babypips where I grabbed the EA nor can I say what the EA is called since it is a only available for purchase. Another reader of this post (I won’t say who unless he’she wants to mention it) has taken the premise of the original EA and has replicated it along with some additional pieces that help safeguard the account balance. It doesn’t help with the draw down aspect but it does have a few checks in place to ensure there is enough margin in the account before it allows a trade to take place. A bit of a summary. I have been running a couple of EAs for just over a year now. My experiences have been up and down…plus there has been a bit of a learning curve. My honest findings are as follows. The EAs work in the sense that it does work while you sleep. It does churn and it does not allow for human intervention (i.e. it doesn’t let emotion or the result of the last trade influence the next trade). It simple does what you or the coder tells it to do and it acts on those directions. Period. This type of system does have its drawbacks…mainly in the form of draw down. It does seem like, as your account grows, so to do the negative open positions. Looking at my charts and knowing when I raised lot sizes and TP targets, I see a direct correlation between those times and a larger jump in negative positions. The only real positions that remain open are, in fact, negative ones because when the position goes positive it almost immediately takes profit. Over time I see that difference (open negative positions vs. profit) shrink and it does eventually get back in the black. Many have asked "what if a position goes negative and remains open and “locked up?”. Well, that is an issue and one that I have grappled with a bit. Do I put in a SL? Do I close positions out after a certain time period? If running a 1M chart and a position has been down for a week…maybe that is ample time to determine if I should get out. I don’t 100% have the answer to that question…and I think it may boil down to each persons pain threshold. As I heard in one of the many webinars regarding a system like this, I have been “letting them ride”. Do they come back? Yeah mostly. Can they be helped along? Yeah, I think maybe that is the only way to truly get out of some of the bad trades. Lately I’ve been using missed pivots in order to determine the likelihood of the overall daily and weekly direction and, on reversal pattern confirmation (assuming the direction is the same as the open position I have with the EA) I load up a bit manually in order to “martingale” the overall position yet again. In fact, I have a USDJPY short trade that has been open for a long long time. I recently took on a larger short manually and I am actually pretty close to getting out of that trade. Long story short (too late): The EA system I have been using has been growing the account quite well…but I would consider it to be a virtual growth since the open positions continue to follow the profit in the opposite direction. The set and forget system I was kind of hoping for …well this isn’t it. I think you have to manually help some trades along. Perhaps we are on the cusp of figuring out how to keep draw down / open positions to a minimum… I will continue to work on this. I think it is 90% there. To all the naysayers, I appreciate your comments. It has really helped me to focus in on where this system may be lacking. If you don’t try you’ll never know… I’ll continue to tweak this. Thanks for your nice and informative article in here, it would be quite helpful to gain the required knowledge in here about the trading with the EAs. I personally don’t like to deal with them but reading your article, make me change my mind and would like to give it a try. Feel free to hit me up through personal message if you have any questions getting set up. There are also tons of videos out there that walk you through getting EAs running on your MT4/5 account. I do strongly recommend (as I have said before) testing this on a demo account. Great thread! Thanks so much for posting your settings and experience. It’s very helpful. This is exactly the information I’ve been looking. I think I know where you got your bots and I’ve been on the fence about getting them for a couple weeks but you’ve convinced me to move forward. I still have no idea what the heck I’m doing and hope that will fix itself as I trade on a demo account. I’ll keep you posted. Did you ever have a go with the Blessings EA? In the meanwhile, equity is going lower and lower. If you would close your account today you would get 31.5k USD back from your broker, which is 7.5k USD less than your initial deposit of 39k USD. Man I would be really frustrated and looking on how to improve my strategy and also reducing my trading sizes to match the lower equity value instead of talking about increasing it. But everyone has their own view on it. That’s so nice about trading! Thanks a lot for the advice Knothead, but I have already tried this once and now I don’t want to deal it again. I have discovered that it is not at all for me, I have lost previously in brokers, in EA s and even in the MT4 and thus I would not able to do the again. Hey Bob! Thanks for the post. Actually, my equity is coming back around. At one point I was down in open positions after upping my lots to the tune of $11k against my profits. I’m only down $3500 at the time of this post…so positions are coming back. Hopefully, if history repeats itself, I’ll be back in the black in the next month or so. Again, I think folks have missed the initial premise of this thread…and even missed the sub-topic. My initial post was targeting the use of a means to ensure lot sizes are not too large…whether you trade with an EA or you trade manually. By risking only a small percentage of your account with each trade it ensures that you don’t over-extend your account. I ran into some trouble back in May because I was running too many pairs. So, the first point of this was that account management in the form of lot sizes relative to your overall account size is crucial. The second “sub-topic” that I think is getting misconstrued here is that my account has been in “growth mode” for about a year. Not growth as in profit, but growth as in potential long-term focused profit (i.e. when the EA fires off a trade and takes profit, I want that TP to be much higher so that when it comes time to stop mucking with lots and TP targets, the profit it brings will be much more per trade than the initial $.50 I started with. The profit thus far has been “virtual” as I said in my previous post. 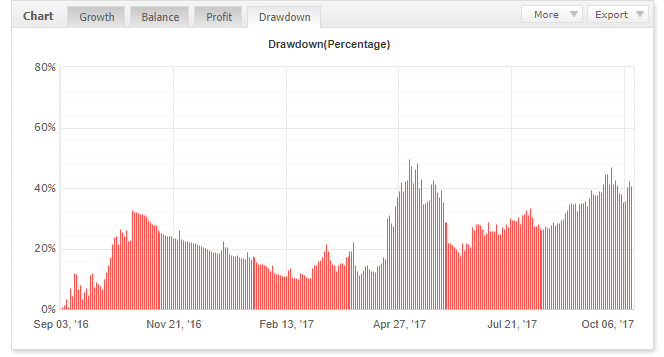 I have stopped moving lot sizes based on account size and, low and behold, the gap between open position draw down and overall profit is shrinking. Like I said before, I noticed this trend over the last year but I continued to move lot sizes higher. My goal now is to leave things where they are and let the account catch back up. I have 3 accounts. The largest one has come back from an $11k deficit to $3500. The middle account was down $4k in deficit and now is sitting at only $900 down. My third account is actually $350 in the positive and continues to keep going. Myfxbook stopped updating on that one for some reason but it is positive. I could close that one today and walk away with a profit. I get what people are saying about how it isn’t a success currently because if I closed everything right now I would lose money. That is true, however, give it 3 months and that won’t be the case. Well…it shouldn’t. Check back in at the end of December. The other point I made in one of my previous posts is that it isn’t a perfect system. The major draw back of this system is draw down and watching a few pairs go way in the red. I may have to manually trade my way back out of them…which I have started to do last week. Here is the large account chart again: MT4 System by knotthead | Myfxbook. - Profit = $15,080, open positions are at -$18,600…so it is coming back. Middle is at: 1M-EA System by sbknott | Myfxbook. Profit is sitting at $2502 I think with open positions at $-3480. This one is rolling back quickly. Third account is here: http://www.myfxbook.com/members/sbknott/3rd-account/2184583 but it stopped updating back on 9/22. This one is back in the positive by $350. Again, I’m not trying to sell anyone on a system other than my initial post which was focused on account/equity management in regards to lot sizes. By methodically using a lot size for each position that is based on the total account size, you are risking the same percentage for each trade. Risk management was the focus of this thread. Somehow (and maybe it is my fault) it has strayed from that to the method I use to administer that theory. Good luck out there everyone. Haters are gonna hate, I get it… I wish everyone the best of luck. Thanks for your good explanation on EA ROBOTS. Could you please help me with guidelines on how to create an EA robot or if have one you can help me. Please will you allow me to access your robot with the settings above? Which 2 EA’s are you using in your strategy, I would like to try this. 14k USD down at this point. I was wondering as there seems to be no new trades taken since beginning of June, have you decided that the system is not working after all? You keep the losing positions open for months now, positions that were opened based on a short timeframe RSI strategy, hoping they ever come back, in the meanwhile paying interest every day. Wouldn’t it be a lot better to close the positions? Sorry, been a way for a while. EAs have been turned off. I’ve been manually trading the open positions based on Price Action to get out of the 15 or so bad EA trades that got out of hand. I’m down to 7 now. Yeah, I get a little taken off the top every day…you are correct. I can’t say that I’ll ever turn any EA back on again. They work great, until they don’t. I had thousands of trades go green (at 5-8 pips for the win)… however it only took 15 or so to completely negate the thousands of dollars I “made” – and then some. One of the fatal flaws of the system was that it would fire off new positions when the margin percentage level of the account was lower than it should have been. A piece of code was put in place by a fellow babypipper to check and make sure no new trades were taken if that percentage was lower than a certain number. The main fatal flaw of this system was the lack of a SL. After tons of research (and following the advice of a well-known FX trader), on the subject of a SL it was understood that the EA would continue to open pairs and you could just “sit on” the open pairs as they would eventually come back. Yeah, not so much. Granted I did have thousands of trades take profit…it only took that handful mentioned above to completely wreck it. If I did it all over again I’d probably instill a trailing stop so that as price moved north the SL would move to break even or higher… and if it moved south immediately (assuming we are talking about long positions here) then I’d be out of the position quicker to avoid the huge malfunctioned trades. I would have to back test to see if a trailing stop would have negated a ton of winners and if the “system” would have then made enough winners to overcome what would most likely be more SLs. Food for thought I suppose. I may paper trade the same system with the margin percentage level piece and the Trailing Stop / Stop Loss to see how it does over a few months. If it does well I may toss a small amount at it and trade it live. As always, thanks for your comments and insight. Makes sense. Good luck with future strategies! Thanks for sharing old experiences. Good luck in future experiences.